In 5-quart Dutch oven, melt butter over medium-high heat. Add pork tenderloin; cook 3 to 4 minutes without moving, until pork releases easily from pan. Stir and cook 3 to 4 minutes longer or until pork is browned on all sides. Transfer to small bowl. Add oil to Dutch oven; add mushrooms, and cook 5 to 7 minutes or until softened. Add rice vinegar and soy sauce; cook 3 to 5 minutes, stirring constantly, until brown bits release from bottom of Dutch oven and liquid is almost gone. Stir in barbecue sauce and broth. Heat to boiling, then gently stir in pork and sweet potato noodles. Reduce heat to low; cover and cook 12 to 15 minutes, stirring occasionally, until sweet potatoes are crisp-tender. Gently fold in spinach; cook uncovered 30 to 60 seconds, stirring occasionally, until spinach wilts. Top with kimchi and cilantro. Don’t peel sweet potatoes too far in advance. They oxidize and darken quickly. Using prespiralized sweet potato noodles measured in ounce-weights? 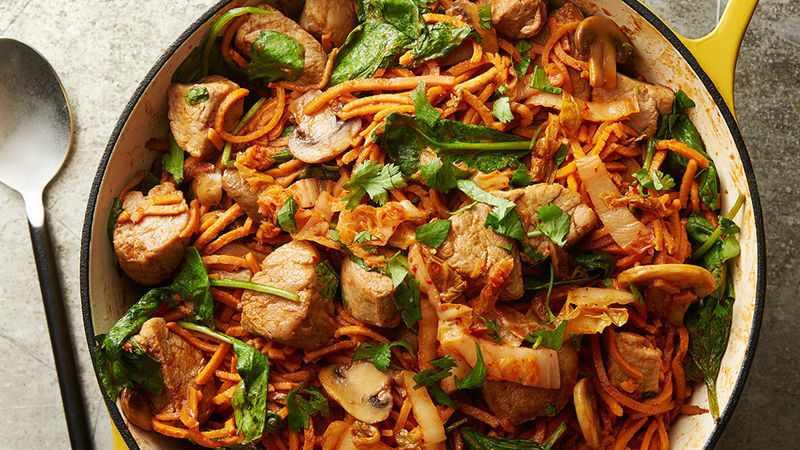 We used 22 oz of sweet potato noodles in this recipe.